At MAPA we aim to inspire and develop industry newcomers to be the best they can be so that they can build strong, sustainable careers in the performing arts industry. 1st prize - 100% 1 years MAPA scholarship. Interview and live performance at TRE Breakfast Show ‘Wake Up with Hannah’ to sing the winning song. 2nd prize - 50% 1 years MAPA scholarship. So, if you think you’ve got what it takes and want to share your songwriting talents and be heard by some of the best songwriters, producers and industry professionals - get songwriting and send in your songs! 2. 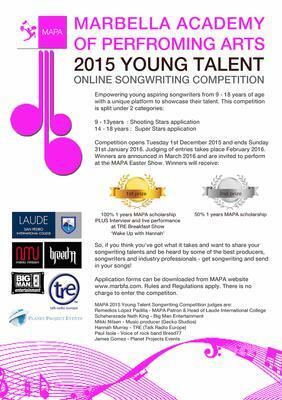 Only 1 song may be submitted per entrant. Entrants don’t need a professional recording as they will be judged on their originality, melody, composition, lyrics and their potential to be a smash hit! 3. An audio recording is just as acceptable as a video recording.This can be as simple as you singing a cappella on to a device or a video recording of yourself jamming your song in your bedroom. 4. If you form part of a duo or a band, you must all be in agreement before submitting to the competition. 5. No entry will be accepted without a completed application form available to download from here.